When I started looking to purchase my first vintage typewriter I’ll be honest, I had no idea what I was doing. I didn’t even know where to start. I did an internet search and found either old, dirty, broken down typewriters or very expensive (and gorgeous!!) refurbished ones. Finally, I found one that looked like “the one” while scrolling through Facebook Marketplace. I made the appropriate arrangements and met up in a local coffee shop. I was so excited and eager to get it home I didn’t test it first. Unfortunately, despite the description claiming that it worked – it didn’t. Bummer. As a result, my husband and I spent several days trying to find someone who could repair it. I had to drive 2 hours, ONE WAY, to pay someone to fix it. 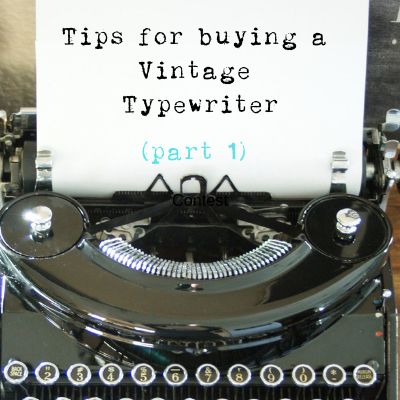 So now that I’ve had a bit of experience buying (and selling) typewriters, here are a few tips in my first post in a series of (hopefully) helpful articles that will make it possible for you to make an educated purchase. 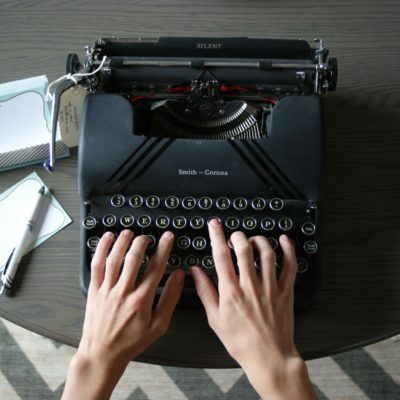 There’s a difference between a writer looking for a typewriter that can punch out a first draft quickly versus a writer who is taking their time to think and be creative while composing. The first definitely needs an electric typewriter, while the other can take their time finding a lovely manual one. If it’s too noisy, it gets on my nerves after about 10 minutes and interrupts my writing focus. If you are a very fast typist, you will need an electric. Manuals will not be able to keep up. Overall, my favorite electric typewriter for working is the Smith Corona Electric 120 or 110. MANUAL TYPEWRITERS: Manual vintage typewriters are fabulous for those moments when you want to be creative and uninterrupted. 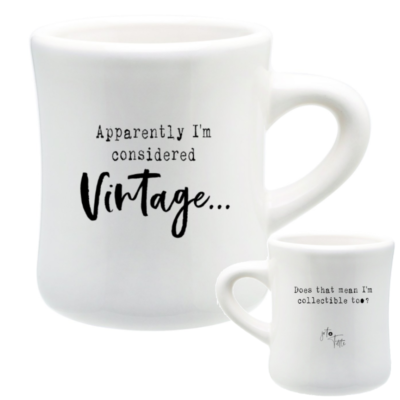 (When I type on a manual typewriter versus my computer, I actually get more writing done! Even though I have to type much slower than on a computer). If the keys have a light touch. The space bar works well. Portable and with a case if you want to be able to take it with you to a coffee shop or a favorite writing spot. Don’t need to move the typewriter? 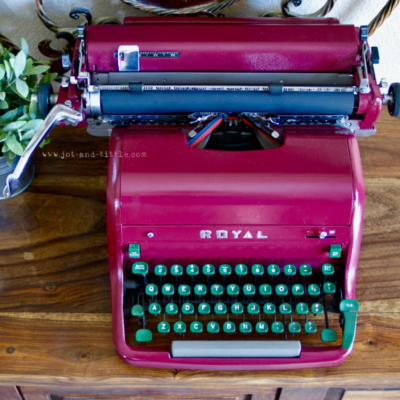 A nice upright Royal from the 50s is super fun to type on and a neat focal point. This silver Remington Typewriter was one of my favorites in terms of feel and the font. I used it to create many of our price tags (it has since sold). 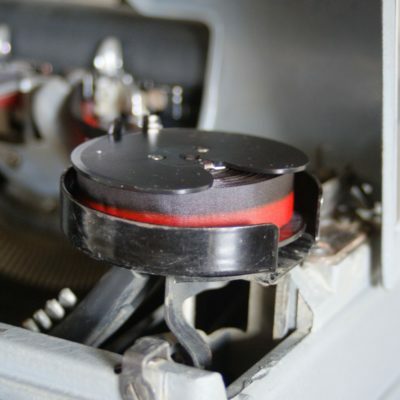 With the typewriter craze gaining momentum, we’ve noticed a large surge in folks posting old typewriters without any servicing or cleaning – and asking a premium price! 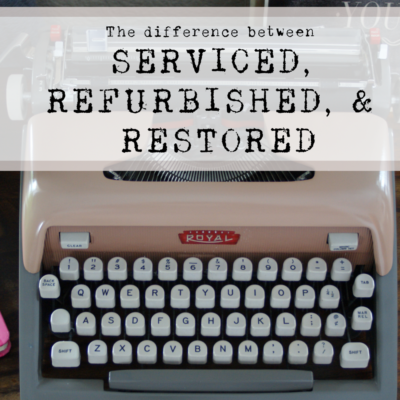 Unless you know how to clean and repair a typewriter, don’t buy one unless it has been serviced and cleaned – or don’t pay much for it. You will spend either a lot of time hunting for YouTube videos on how to clean and repair it or spend quite a bit of money paying someone else. Also, if it hasn’t been tested – stay away. Be aware there are various levels of cleaning and servicing. Understanding the difference is extremely important. (I will discuss this in detail in my next post). If the seller hasn’t even bothered to clean the typewriter and put a new ribbon in it, I guarantee you won’t know what you are getting. If they are seriously in the typewriter business, they will take the time to replace the ribbon and, at the very minimum, clean it up. Otherwise, you will end up searching for a hard-to-find typewriter repair person and pay a pretty penny to get it fixed. Typewriters that are in demand right now are, well, old. This means that you need to expect that they will have their little bumps, scratches, whirs, pings, and hiccups. That’s what makes each typewriter so full of character. 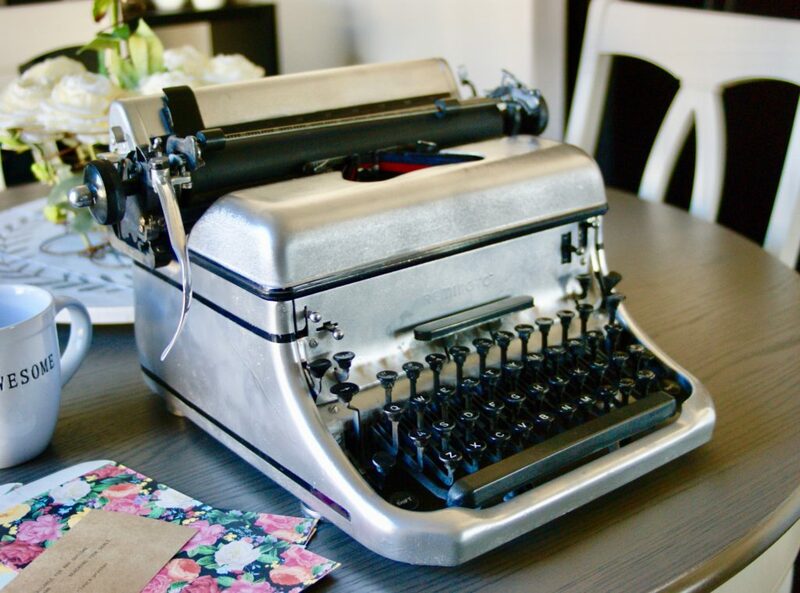 If you set your expectations with that in mind, you’ll be able to embrace your typewriter’s quirks into your own creative process! You will find a huge discrepancy in pricing based on a wide range of factors. I will cover this in detail in my next post, but do your research and make sure that the price you are paying reflects the condition of the typewriter, it’s popularity, whether or not it has a case and original manuals, and proper shipping. SHIPPING: Shipping costs are usually the biggest surprise for first-time buyers. Typewriters are very heavy and in order to pack them in a way to get it to you safely, you can expect to pay a MINIMUM of $50 to have it shipped to you. We find that the average cost to ship a typewriter, including the packaging and insurance, is well over $50. Our average shipping cost for our customers is around $75. 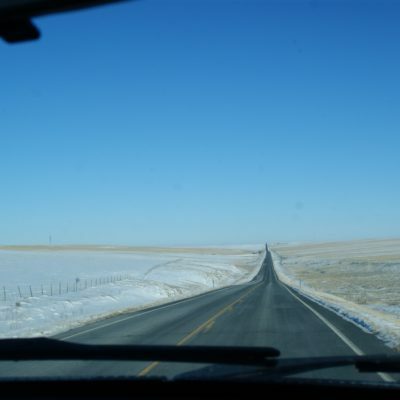 (Certain parts of the country are much more expensive). How it will be packed (we’ll cover this in another blog post. Typewriters have to be packed in a certain way). Is there sufficient insurance to cover both the cost of the item and the shipping paid. 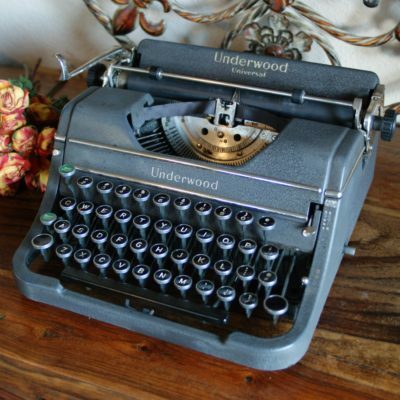 Most typewriters are sold AS-IS due to the nature of vintage items. However, there are some professional typewriter repair people who sell refurbished and restored typewriters for a premium price. These folks do offer warranties on their work because they are either repairing or replacing many of the parts within the typewriter. You will have to pay for shipping back and forth – and have it properly packed. (Think $$$$). 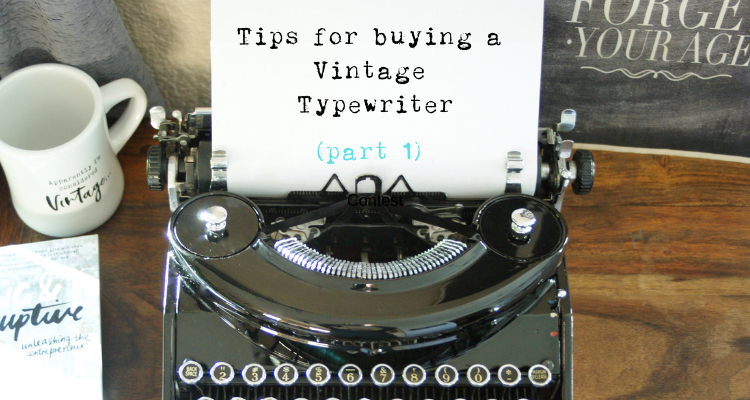 This is just a few basic suggestions when you are looking to purchase a new-to-you vintage typewriter. 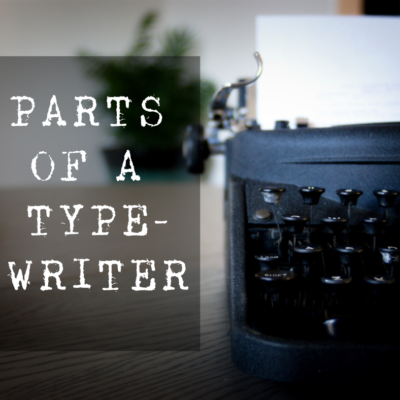 Obviously, there are more tips, so follow along with our blog as I continue to cover topics on typewriters. Also, feel free to ask us a question on our Facebook page or through our contact form!